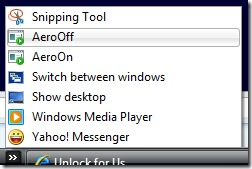 Windows Vista has an amazing built-in feature to launch programs located in Quick Launch bar using a keyboard shortcut. Just use Win+(Position of the icon), e.g. Win+1 To Turn off Aero using a Keyboard Shortcut. That's it! Using this feature you can now Eject CD/DVD easily. How? 1. Download Winflog eXTreMe, Extract the ZIP file and then locate the file "ControlCD.exe". 2. Create a shortcut and Drag it to Quick Launch bar. 3. To launch the application, press Win + Position of the icon. Note: Don't forget, Shortcut keys are limited (1-9 and 0 only). If this doesn't work, ControlCD is not yet Activated, Open Winflog Extreme and click "Eject CD" to Add the Right-click -Menu entry.